There are many things in life that are shrouded in mystery. Things like urban myths and old wives’ tales always keep our curiosity tickled, and you may be dying to get to the truth of an issue for peace of mind. Your smile is no different! There are so many things that people may not know about their smiles; things that they may not know are true or not. 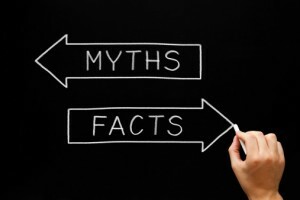 Your smile is something you should never play around with, and we would like to clear up a few myths in order to contribute to your peace of mind. A dental myth that you may have heard is that is teeth whitening weakens the durability of your smile. For those who want to brighten their smiles with teeth whitening, you have nothing to worry about, as this myth is completely false. When you go to have your smile whitened, the gel that the dentist places on your smile only affects the color of your enamel, not the strength. Though it is normal to experience some sensitivity with your smile after having the procedure done, it does not weaken the internal structure of your teeth. Another dental myth that you may have heard is that you should not brush or floss your teeth if your gums are bleeding. This is actually the exact opposite of what you want to do, and there could be many reasons why your gums could be bleeding. Bleeding gums is usually a sign of plaque and other particles irritating them.Bacteria in plaque invade the gum causing inflamation and bleeding.It is important to remove whatever is aggravating your gums as soon as possible. Brushing and flossing your teeth as well as you can is one avenue you can take in order to stop your gums from bleeding.Brush and floss the teeth you want to keep. Dental myths seems to plague the minds of many people, and by putting some of them to rest, we hope that you are able to experience better oral health and better knowledge as to what goes on with your smile.